The Nobel Prizes in Physiology or Medicine have rewarded several achievements that helped to reveal the mysterious complexities of the nervous system. The breakthroughs made by each of the Nobel Laureates below have provided us with a better understanding of how nerves are made up, and how they create and transmit information in the form of nerve impulses that monitor and co-ordinate all the activities in our bodies. Click on each link to see a Speed read, our brief summaries of the breakthroughs for which each Nobel Prize was awarded. By developing and using methods that stain key components of nerve cells silver, Golgi and Cajal revealed the beauty and complexity of the nervous system. Controlling the constant and intricate network of electrical signals buzzing through the nervous system relies on two basic principles formulated by Sherrington and Adrian. Dale and Loewi discovered that nerve cells communicate with each other, and with their target organs, using chemicals. Erlanger and Gasser constructed a recording device which revealed that different nerve fibres transmit different kinds of impulses. Waves of charged atoms flowing in and out of cells provide the spark that fires electrical impulses through nerves. The three researchers independently showed how chemical neurotransmitters can send information from one nerve cell to another within the blink of an eye. 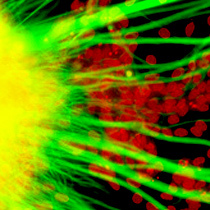 Levi-Montalcini and Cohen discovered that nerve cells release growth factors that stimulate and regulate the development of the fantastically complex nervous system. A highly-sensitive recording device created by Neher and Sakmann proved that nerve cell membranes have individual ion channels through which tiny currents pass. Carlsson, Greengard and Kandel deciphered the chemical messages passed across nerve cells that regulate some of the brain’s most important functions. These Speed reads are an element of the multimedia production “Nerve Signaling”. “Nerve Signaling” is a part of the AstraZeneca Nobel Medicine Initiative.